How can I set stay restrictions using the calendar? HOME > REVENUE AREA > How can I set stay restrictions using the calendar? 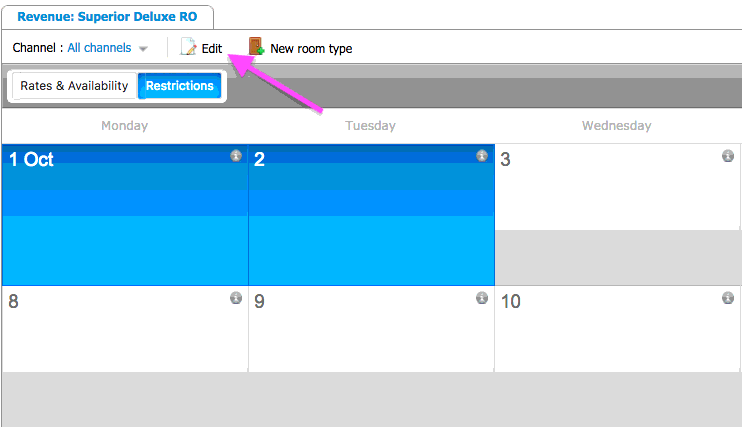 STEP 3: Make sure you select the relevant calendar (the specific button will become highlighted in blue), select the dates using the calendar, and then click on EDIT. Closed to Arrivals (CTA): When "closed to arrival" is set for a date, a guest can not book this date if their stay begins on this date. If their stay includes this date, but does not begin on it - then it would be bookable. Closed to Departures (CTD): When "closed to departure" is set for a date, a guest can not book this date if their stay ends on this date. 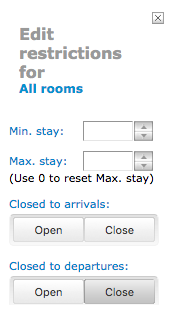 If their stay includes this date, but does not end on it - then it would be bookable. STEP 5: Click on the "Apply" button and then revise and confirm your changes by clicking on the REVIEW AND PUBLISH CHANGES. 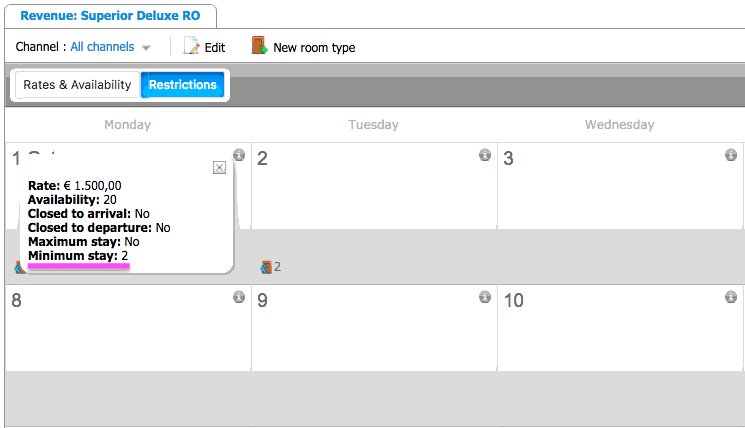 STEP 6: The calendar will now display the restrictions you have defined. When adding a minimum stay restriction, it applies ONLY to the selected date. For example: If a minimum stay of two nights is applied on a Saturday in order to be considered until Sunday, the restriction needs to be set also on Saturday and Sunday.